A two-vehicle crash in Schoharie, N.Y., on Saturday has left 20 people dead. Just before 2 p.m. on Saturday, the easygoing get-together ended in an unimaginable nightmare: State Police say the 2001 Ford Excursion limousine charged down a steep state road, blew past a stop sign and careened into the parking lot of the Apple Barrel Country Store & Cafe, where the limo struck a parked and an unoccupied 2015 Toyota Highlander, and two people. 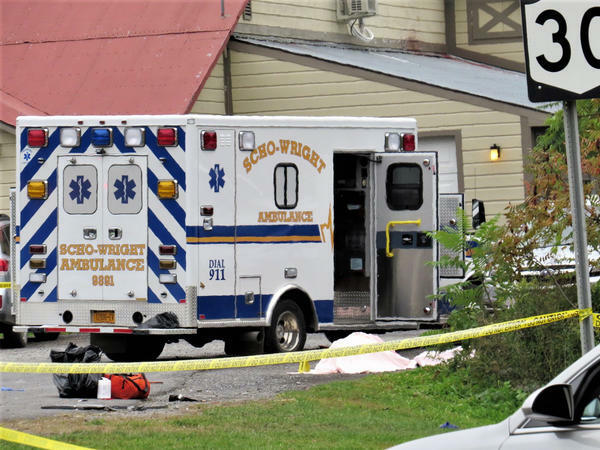 The collision in Schoharie, N.Y., killed all 18 people in the limousine as well as the two pedestrians in what federal officials say is the deadliest transportation crash in the country in nearly a decade. "Twenty fatalities. It's just horrific," said Robert Sumwalt, the chairman of the National Transportation Safety Board, which is investigating the crash. "This is one of the biggest losses of life that we've seen in a long, long time." New York State Police, who also are investigating the crash, have not said how fast the limousine was traveling nor whether the vehicle might have experienced a brake failure. Authorities would not comment on whether any of the passengers were wearing seatbelts. The victims' names are being withheld pending notification of relatives, according to a police statement. Their bodies were transported to the Albany Medical Center for autopsies. Amy Dunlop-Johnson, who spoke to NPR on Sunday, said three of her relatives were among the dead: her cousin, Axel "A.J." Steenburg, 29; his wife Amy; and his brother, Rich, 34. "Amy and A.J. just got married in June," Dunlop-Johnson said. "They were the couple everyone envied. They had a perfect relationship. They were so good together, always laughing." Rich Steenburg's wife, Kimberly, had intended to join Amy's birthday celebration but decided Saturday morning to bow out because she was not feeling well, Dunlop-Johnson said. Rich and Kim were raising two teenage children and they had just purchased a home together, she added. Dunlop-Johnson, who lives in Albany, about 40 miles away from Schoharie, said that among her many relatives, she was especially tight with Rich and Axel. "It's devastating," she said. "We always got together, and go out to bars and go to parties and have a good time. We were the close ones. It's shocking that this happened." Local residents described the T-shaped meeting point between State Routes 30 and 30A in front of the country store as notoriously hazardous. "The intersection is a very dangerous intersection," Schoharie Town Supervisor Alan Tavenner told WAMC. There has been "at least two instances where tractor trailers lost their brakes and went through the intersection," leading the New York State Department of Transportation to ban them from State Route 30, he said. As part of their investigation, officials plan to look into the condition of the roadway, the driver, the vehicle and the limousine company, Sumwalt of the NTSB told reporters. Schoharie County's emergency line received calls about the accident around 1:55 p.m. Saturday, police said. State and county officers, as well as fire and EMS agencies, rushed to the scene. Witnesses described commotion as first responders broke windows in an attempt to rescue victims. "I heard some screaming. It looked serious because people were running back and forth," local resident Bridey Finegan told WNYT NewsChannel 13. "That limo was coming down that hill probably over 60 miles per hour," Jessica Kirby, manager of the Apple Barrel Country Store, told the New York Times. Bill Waterson, who lives nearby, said he was stunned by the sight of the wreckage. "All the car parts, door panels covered in blood still on the ground and everything. It was bad," he said. "I'm 68-years-old, I've never seen so much destruction." Gov. Andrew Cuomo directed state agencies to provide "every resource necessary" to aid in New York's investigation. "My heart breaks for the 20 people who lost their lives in this horrific accident on Saturday in Schoharie," he said in a statement. New York Sen. Chuck Schumer said on Twitter: "May God bless the families who lost loved ones, as well as my dear friends from Schoharie emergency service agencies who responded." The small town of Schoharie is known to attract tourists in the autumn as leaves change. The Apple Barrel Country Store posted a message on Facebook saying it was collecting donations for local volunteer emergency services and asked people to "come and share your smiles, love, friendship and hugs with us." Relatives of the Steenburgs set up a GoFundMe page to help defray the costs of funeral expenses. A vigil was being planned for Tuesday night. Dunlop-Johnson, who, along with the loved ones of other victims, waited for updates at a firehouse in Schoharie, said they are in shock. "Everybody is still trying to process this," she said.